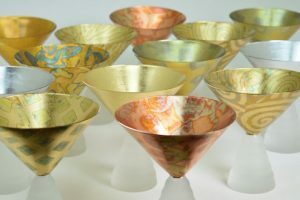 Tamara Childs has been creating exquisite artisan craftsmanship in home décor for over 30 years. Hundreds of her hand-gilded pieces are sold in more than 700 of the finest stores, museums and galleries worldwide. ​ Each piece touches her hands, then her son Adam’s and every order is made custom. This artisan attention and uniqueness is so rare! They are a small business doing big volume, and most of it is wholesale, retaining theses relationships through the trade show route. They wanted to get out in front of the customers on an ongoing basis through social media, newsletters and blogs. They also want to increase their direct sales through online sales. All of their content marketing is now humming and growing and our next big step is online ads. Stay tuned! Check out this gorgeous collection.